May 12, 2010 from the airfield Kazan Aviation Production Association. SP Gorbunova climbed the first flight of a new aircraft, made ? ?by order of the Administrative Department of the President of Russia, air control point Tu-214PU (RA-64517). The machine is designed for the flight home and during visits abroad the highest state leaders President and Prime Minister of Russia and equipped for the comfort of all the necessary means and equipment of various communication and management. The first flight of the new aircraft was performed a crew of test pilots AI Zhuravlev (crew chief) and DY Vyazankina (co-pilot), flight engineer EB Volkova, EA navigator Kudryavtseva and lead testing engineer VN Filimoshkina. 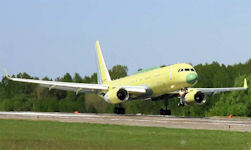 The current TU-214PU became the third machine issued in the last two years KAPO commissioned by the Office of the President of Russia. In the past year, the Special Flight Detachment "Russia" were officially handed over to the two relay Tu-214SR (RA-64515 and RA-64516). Both flew from Kazan to the base of the Arctic Ocean, "Russia" at a Moscow airport "Vnukovo" June 1, 2009. The second copy of the Tu-214PU (RA-64520) was released January 2011. Overall, available at the Kazan aircraft manufacturers order from UDP provided for the release of the six "spetsbortov": two Tu-214SR, two Tu-214PU and two "aircraft communication nodes" Tu-214SUS. All of them are equipped with PS-90A engines of development and production of the Perm Motors Group and by the installation of additional fuel tanks under the cabin floor have increased to 10 500 km distance non-stop flight. At one of these Tu-214PU transmitted into operation Special Flight Division (SLO) "Russia", in October 2011, President Dmitry Medvedev made the first flight. The aircraft is based on long-haul passenger Tu-214, but is significantly different from the production model. It has a special technology, while the interior is made according to the original design.